There where thousands of ducks and geese on Webster Pond but only one swan. He was a calm in a sea of flying feathers and noisy neighbors. This is my photo for the Assignment: White. I’ll be posting my recap next week. Thank you all for participating. 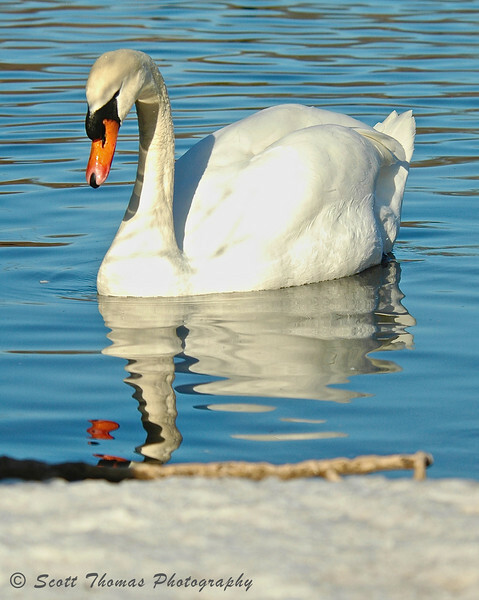 This entry was posted in Animals, Assignments, Nature and tagged bird, blue, calm, grace, new york, Photography, reflection, snow, swan, syracuse, water, waterfowl, webster pond, white. Bookmark the permalink. I like visiting Webster Pond with you, Scott. The swan is lovely. Peering into the water for a snack, I’d say. Thank you, Gerry! Yes, he was in feeding mode. Thanks, KD. It’s a little hot in a couple of places. May try out some dodging in post to see if I can improve that some. Beautiful shot and a beautiful bird! The bird is beautiful and thank you for saying the shot is, too, Terry! Thank you for looking that up, Birgitte. I did not know what the sexes were called either. The knowledge we learn around her just amazes me. Absolutely beautiful Scott, such an elegant Swan! Thank you, Nye. Swans are elegant, the trick is being able to photographic it. Makes me happy you feel I did. Love this shot! Right down to the texture of the feathers. Swans always seem to look so very elegant and you’ve captured his/her grace and beauty. Lovely!